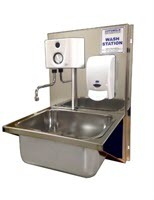 Auto Hand Wash Stations Cotswold hand washing unit with hands free hot water delivery, using sensor and bactericidal soap dispenser, for use on dairy, poultry, pig farms and any site, shop, garage factory etc, where hand sanitizing is needed. The Cotswold Hand Wash Station has a deep, wide, easy clean stainless steel bowl, which makes it more adaptable for different applications. The whole unit, apart from soap dispenser and heating unit, is constructed from stainless steel, with a finger tip operated soap dispenser and an instantaneous water heater with infrared hands free start and shut off.